I would be happy to answer them. Raphael Tuek & Sons. The stamp is Scott #300. It can be proudly worn on your hat, cap or lapel. Order extras for family and friends. My reference number 14443. Patriotic Boy or Boy as Uncle Sam. Antique patriotic/military postcard - Fraternity, Loyalty and Charity, ‘The men who in the conflict led, and for the Union fought and bled, tho passing are never dead.’, Army of the Republic, Civil War, not posted, no writing on back, Decoration Day Series No. 1. Condition is fairly good - no real creases on corners but some wear, some wear on the edges, no tears, some yellowing, no stains. July 4th 1776. I would be happy to answer them. Condition is good with bumped corners/edges; tiny bend top left corner. Title: 4th of July. Categories: More Topics/Patriotic/4th of July. 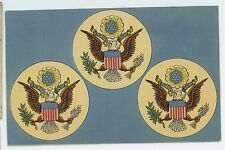 4th of july vintage postcards 1908 ( 2 ) embossed. Condition is Used. 2 very nice embossed july 4th postcards. dated 1908 on back. Condition is good to very good overall; see photos for details. Never a reserve! Check back to see what I’ve discovered! You never know what I will dig up in Western Pennsylvania! It can be proudly worn on your hat, cap or lapel. Order extras for family and friends. My reference number 15512. Our Martyred Presidents. William McKinley. Abraham Lincoln. Lot of 35 Antique Patriotic Holiday Greeting Postcards 4th of July Memorial Day. Condition is Used. Dates on the post maks are in early 1900. Cards have been kept in a box so minimal wear on them. I have included one of a woman with the flag as an extra one. It is the only one with creases in it. I just like it as it was different then many others . Shipped with USPS First Class Package. First Fourth of July. I would be happy to answer them. Th of July greeting featuring a log cabin used as a Revolutionary War Headquarters. Condition: Minor corner/edge wear, light soiling, age toning. Very Good condition. Sold AS IS. SEE PICTURES to Judge Condition for Yourself. 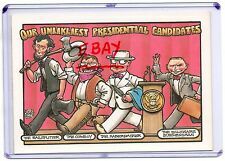 Embossed 25 Presidents Thru T. Roosevelt WJ BRYAN Postcard OUR CHOICE Is He Next. Unused - minor corner/edge wear. See Picture. McGrew Pub. President Ronald Reagan as child. Jack and Nellie Reagan's family. Ronald and (Moon) Neil. Christmas card of 1917 with. NEWer card. This picture is from a 1903 photograph of the 26th president of the United States Theodore Roosevelt with his second wife Edith Kermit Carow (seated), their five children and his daughter from his first marriage (center, standing). COMMUNIST HOUSE OF REPRESENTATIVES CONGRESS. CORNER CREASE MINOR. Patriotic embossed Greeting showing a bust of President Lincoln and Flag with words, "He lives in endless fame, All honor to his patriot name". Unposted, no writing or markings on the back of this card. Corners and edges have wear. Please see scanned image(s) to check for condition on this postcard. Any watermark used on images are for listing purposes only. Shipped in a hard sleeve for protection.